Home» » AP Emergency Response Services Chandranna Sanchara Chikitsa (MMUs) prohibited 6 months as per G.o.No 6. 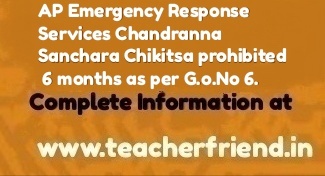 AP Emergency Response Services Chandranna Sanchara Chikitsa (MMUs) prohibited 6 months as per G.o.No 6. AP Emergency Response Services Chandranna Sanchara Chikitsa (MMUs) as Essential Service for the purpose Emergency Response Services prohibited for a period of six (6) months Order as per G.O.MS.No. 6 Dated: 22-01-2018/AP Emergency Response Services Chandranna Sanchara Chikitsa (MMUs) prohibited 6 months as per G.o.No 6. Pradesh Essential Services Maintenance Act 1971 (A.P. Act. 20/1971) Strikes by Emergency Response Services Chandranna Sanchara Chikitsa (MMUs) prohibited for a period of six (6) months Order as per G.O.MS.No. 6 Dated: 22-01-2018. G.O.Ms.No.359, GA (SW) Deptt., dtd.5.07.1983. From the Commissioner of Health & Family Welfare, Vijayawada , Lr.Rc.No.146/CSC-104/CH&FW/2016, dt.13.12.2017. of the Andhra Pradesh Gazette dated.22.01.2018. Andhra Pradesh hereby declare the services of Emergency Responsive Services Chandranna Sanchara Chikitsa (MMUs) to be “Essential Services” for the purpose of the said Act. Chandranna Sanchara Chikitsa (MMUs) to be the Essential Services which is declared vide Notification -I above, for a period of six (6) months with immediate effect, in the public interest.